Works with iPhone, iPod touch, and iPad.Requires iOS 4.1 or later. 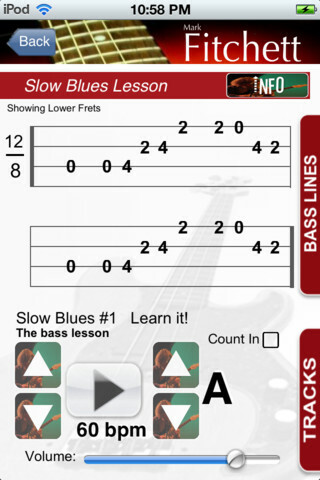 It combines tablature and audio demonstration to teach you various bass lines. It also includes a background rhythm track for practicing then and a longer audio track for laying down your bass on an entire song. Other lessons even include video demonstrations. The lessons can also be applied to various tempos and can be slowed down. Learning in various keys and tempos will quicken your learning by a big margin. Additional lessons are available in the in-app store.